SEATTLE, WASH. – April 2, 2018 – Redhook Brewlab is throwing a three-day party to celebrate craft beer’s top style, the India Pale Ale, as it hosts IPA Daze from April 20 to April 22. The event will feature a total of 32 IPAs: 16 from Redhook, and 16 from a who’s who of Evergreen State brewers. Everyone will be bringing their “A” game – with a variety of takes on the IPA, from traditional and imperial IPAs to fruit IPAs and hazies. A portion of the proceeds will benefit the Surfrider Foundation, Seattle Chapter. IPA Daze will run April 20 - 22, on Friday from 3 p.m. to midnight, Saturday from noon to midnight, and Sunday from noon to 10 p.m. So where do the baby goats come in? 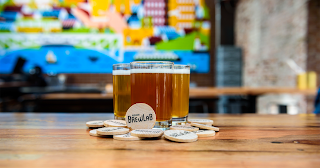 Redhook wanted to give guests a special 4/20 treat, so Brewlab will have small petting zoo outside Brewlab from 5 to 7 p.m. on the opening day of the festival. And KEXP DJs will be on hand all three days to keep the music fresh. Over the three-day IPA Daze extravaganza, fest-goers will also have access to some of Washington’s best breweries, as guest IPAs will be made by: Elysian, Georgetown, Holy Mountain, Fremont, Black Raven, Crucible, Matchless, Chainline, Stoup, Aslan, Reuben’s, Wander, Hellbent, 20 Corners, and Silver City. Additionally guests will find 16 different takes on the style from Crandall and his team at Brewlab. From imperial IPAs to a Cascadian Dark Ale and a Belgian IPA, Crandall’s inventive beers for IPA Daze run the gamut. Did we mention that this glorious event is free? Yes, entry to the event is free; however tokens will be required for beer purchases. Tokens are $1.50 each; four tokens for $6 dollars; nine tokens for $12, or 20 tokens for $25. One token equals one taster; four tokens equal one pint; six tokens will get you a taster tray. Redhook was born out of the entrepreneurial spirit of early 1980s in the heart of Seattle. While the term didn’t exist at the time, Redhook became one of America’s first craft breweries with its focus on creating a better beer. From a modest start in a former transmission shop in the Seattle neighborhood of Ballard, to a Fremont trolley barn that housed The Trolleyman brewpub, to its current breweries in Seattle, Wash., and Portsmouth, N.H., Redhook has become one of America’s most recognized craft breweries. Redhook opened a 10-barrel brewpub in the Capitol Hill neighborhood of Seattle in 2017. Redhook’s 2018 lineup includes Big Ballard IIPA, Bicoastal IPA and a variety of seasonal beers, including My Oh My Caramel Macchiato Milk Stout, Tangelic Halo Tangerine IPA, Winterhook, and more. Redhook beers are available on draught and in bottles and cans around the country.